Stir together chili powder, cumin, garlic powder, onion powder, salt, black pepper, oregano, paprika, and cayenne pepper together in a small bowl. Set aside. 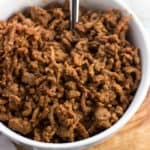 Add ground turkey or beef to a skillet set over medium heat. Break the meat up into crumbles as it cooks, stirring everything up as needed until no pink remains and the meat is fully cooked. If using beef, drain the fat off. Evenly sprinkle the taco seasoning mix over the beef in the skillet. Raise the heat to medium-high and pour in the water. Let everything simmer, stirring occasionally, until the water has nearly all reduced. Serve. Nutritional information is estimated for one-quarter of a batch made with ground turkey. It will vary depending upon the meat you use.